IoT-enabled industrial gateway easily enables smart buildings & industrial applications. Previously, businesses who used the Candi Controls IoT Platform to monitor, control, and manage data from communicating devices paid extra and waited longer for industrial PCs to be custom-configured. With the launch of the CC150, Logic Supply is pre-configuring an application-specific Internet of Things Gateway with Candi’s embedded IoT Server® software stack at no additional cost, which interoperates with the Candi Network Operations Cloud™ right out of the box. "Commercial class gateways are at the heart of the industrial Internet of Things," said JP Ishaq, Product Manager at Logic Supply, "By creating an off-the-shelf solution for our customers who use Candi’s IoT platform, we are reducing the time-to-revenue every business desires." The CC150 is a fanless Intel Atom-based industrial computer that comes standard with the embedded IoT Server® from Candi Controls. It enables bi-directional data connections to hundreds of IoT devices regardless of brand, protocol, or standard. The CC150 offers HDMI and VGA, six USB 2.0 ports, two RS-232 COM ports, and Gb LAN. It is expandable via two internal PCI Express Mini Card slots. 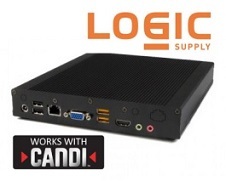 "We searched for a gateway partner with a track record of product availability, expertise, and customer service to supply enterprise customers with industrial PCs," said Candi CEO, Steve Raschke, "Logic Supply was the nimble, highly capable, and quality-focused company Candi needed to support the requirements of our customers who deploy and resell IoT Services."